NU-CONcept absorbs the Domestic USA Express Mail costs over $29 if your package is heavier than expected. Whenever possible NU-CONcept will use Priority Mail unless this Express mail option is selected. 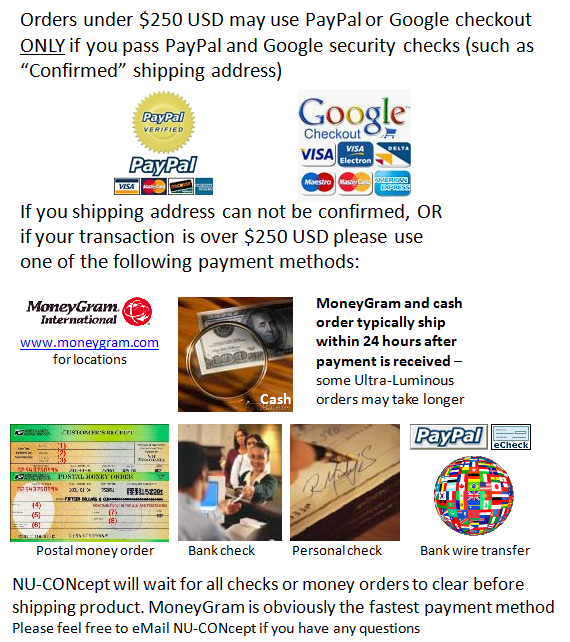 In addition, NU-CONcept strives to ship all orders within 24 hours of payment. (baring holidays, weekends or vacation). Please click "add to cart" (below) which will add $29.00 to your order for the "overnight" Express Mail option which is ONLY available to residents of the United States. Note: "Overnight" Express mail is ONLY available to customers with a "Confirmed" PayPal or shipping address AND this option is, of course, available to customers who mail bank check, money order, check(*) or cash. Express mail will also be available to customers using or . If you selected the Express Mail option and PayPal notifies me that your shipping address is "unconfirmed", then your payment WILL be refunded so you can select another payment option. If your order is over $250, feel free to deduct money transfer fees from your payment. But, don't forget to add $39+ for international shipping. Note: PayPal should be able to confirm shipping addresses in the USA, Canada, U.K. Puerto Rico. PayPal confirms shipping addresses my insuring that your credit card billing address is the same as your shipping address. Over time PayPal will expand countries from which they can confirm addresses to.